This Saudi Aramco’s refinery build in 1981 is producing more than 100 KBD. The cooling water system includes central cooling towers, a piping network of many kilometers length and approximately 300 heat exchangers and machines which have to be cooled. The total inner volume of the cooling loop is 5,500 m³. The feed water there are about 2,000 TDS, the blow down at around 5,000 TDS. This corresponds to a COC of 2,5. The production has every 3 years a planned shutdown, to check the heat exchangers and the integrity of the whole plant. Most equipment show problems with deposits. In the heat exchanger not only in the tubings, but also at the shell side. 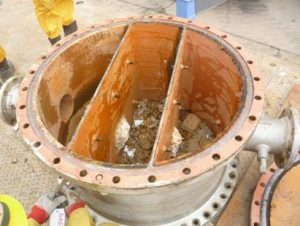 Corrosion is a big problem as well, which caused emergency shut downs. The cleaning procedure is always done the same way. One heat exchanger after the other is disassembled, cleaned mechnically and chemically and assembled again. This takes a lot of time and money. At first Merus Rings were installed at a few of the most critical heat exchangers. Those were easy to open and check. The first pictures show the development in one of the heat exchangers. Before the installation after 6 months of operation the heating bundle was incrusted. Apart from rust, limescale and mud, foreign substances brought in through the cooling towers settled. 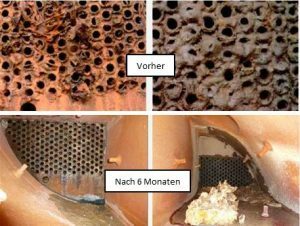 At this state the heat exchangers were opened only to take these pictures before installing the Merus Rings. No cleaning was done before they were closed again to start the trial phase. The pictures below show inlet and outlet of a pipe belonging to a heat exchanger with 6 chambers. After 6 months of water treatment with the Merus Ring the surface is clean. Deposits, limescale and corrosion is gone. erus Rings at 50 more heat exchangers. At the next regular downtime these were opened for servicing. It was clearly distinguishable, on which of them the water was treated. These were cleaner or fully clean than the untreated ones. Apart from that you can see the Merus effect on the photos. It is transmitted with the direction of the flow. Here you can see that upstream (before the Merus Ring) there are still deposits and corrosion. Whereas downstream the pipe is nearly clean. The parts which were reached by the Merus Ring have a clean surface. As this was a trial we installed enough Merus Rings to protect sensible parts in the heat exchangers. 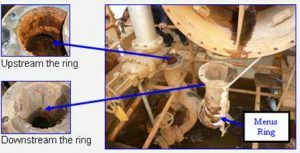 If the whole system with all pipes should be free from corrosion and deposits more Merus Rings are needed. The last picture shows the head or flange of one heat exchanger. The picture was taken before its transport to a special cleaning place, as this is not done in the refinery. When the head was placed on the ground with a hard slam corrosion particles, rust and limescale just fell off the surface. This convinced the customer that cleaning the components is very easy, if the water is treated by Merus. Now it is often sufficient to clean the parts with a high-pressure cleaner. The long-term goal of this installation is to optimize the refinery’s performance by keeping the whole cooling loop clean. Therefore some Merus Rings had to be replaced and added.